Most schools are not teaching children about green issues in anything but a piecemeal way, schools inspectors say. The government wants schools in England to be "sustainable" - that is not impacting on the environment - by 2020. 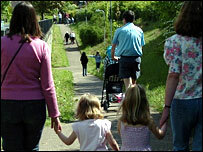 But according to Ofsted, few schools are making the environment central to the curriculum and school life. over-emphasis on tests is to blame. The government describes sustainability as "a way of thinking about our lives and work - including our education system - that doesn't destroy the planet". In a report called Schools and Sustainability, A Climate for Change, Ofsted concluded: "Most of the schools visited had limited knowledge of sustainability or related initiatives. "Work on sustainability tended to be piecemeal and uncoordinated, often confined to extra-curricular activities and special events rather than being an integral part of the curriculum. "Therefore, its impact tended to be short-lived and limited to small groups of pupils." However, teaching in lessons on environmental issues was "often good and sometimes outstanding". Ofsted's chief inspector Christine Gilbert said: "The best schools are investing in their own long-term sustainability and making their buildings more environmentally friendly. "However, too often sustainability is a peripheral issue. More schools need to make sure it is a key feature of their development plans." Christine Blower, acting general secretary of the NUT, said the report made "worrying reading". "Far too few schools are teaching about the biggest issue facing the planet,” she said. "Schools are over-burdened with a range of excessive and unreasonable external demands, including an overloaded curriculum and a high stakes testing regime. "This makes it harder to focus on teaching about climate change and sustainability, vital though it is." Curriculum changes announced last year for 11 to 14-year-olds include plans for greater emphasis on environmental issues. And schools are told to encourage more families to walk to school rather than drive, to lessen the impact on the environment. The Westminster government has sent all secondary schools in England a copy of Al Gore's climate change film An Inconvenient Truth and the devolved administrations in Wales and Scotland have done the same. The film - which came with guidance notes which had to be updated following a legal battle - was part of a package of resources for use in science, geography or citizenship lessons. A spokesman for the DCSF said: "We know there is more to be done to promote the outstanding work already going on in schools - so there will be no slowing down in the investment in greener school buildings; improving training; and supporting teachers and local authorities. "Sustainability is not some bolt-on on to school life - so we simply don't accept the charge it has been crowded out of the curriculum. No one has ever said that this is a change that schools can make on their own - it's down to parents, business and communities to play their part. "The National Curriculum is clear that sustainability cuts across all subjects and is a statutory requirement in geography, science, citizenship and design and technology. "The new secondary curriculum from this September gives teachers the scope they have always demanded to bring ideas like climate change and sustainable development into their day-to-day teaching - and current primary review offers the same chance to younger pupils."